Since DVD is widely used to store media, there are many occasions when you want to rip DVD to videos. For example, you may want to watch your favorite DVD movies on your portable devices or back up the movies to your computer's hard drive. This guide will teach you how to use DVD Decrypter – a free DVD ripper for Windows (Windows 8 included) designed for users to rip DVDs to VOB videos and remove DVD protection. Just follow the step by step DVD Decrypter guide below and rip your decrypted DVDs in an easy way. Note: DVD Decrypter is only for Windows (Windows 8 compatible). If you are a Mac user, please go to DVD Decrypter for Mac. First, download and install DVD Decrypter. You can go to http://www.dvddecrypter.org.uk/ to download the latest version 3.5.4.0. After downloading, follow the wizard to install the program and launch it. Then insert the DVD that you want to rip to your computer's hard drive and make sure you have enough free disk space. When you start the program, on the source drop-down menu, select the right DVD drive. And under Destination, choose the location where you want to store the ripped video files by clicking the little yellow icon. 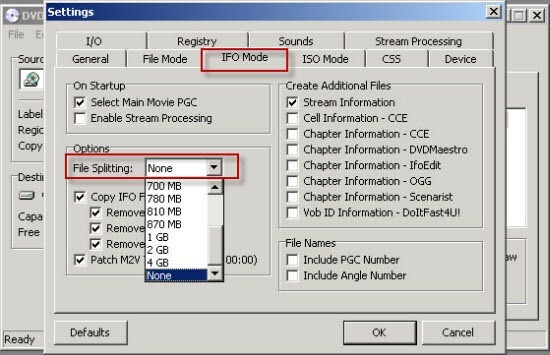 To rip DVDs correctly, please choose IFO under “Mode". 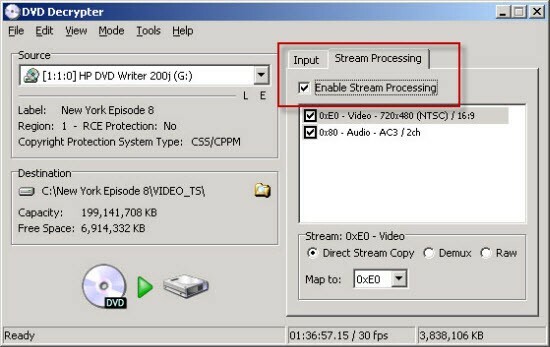 If you have some other video and audio options, you can go to Stream Processing tab and choose Enable Stream Processing and select the video and audio track you want. To ensure you get the entire movie, you can go to Tools > Settings and under IFO Mode tab, choose None for File Splitting. Then click “OK" to save the settings. Now go to the final step. Just click the "DVD to Hard Drive" button and let the software do the DVD ripping for you. When the ripping process finished, you can get a VOB file. 1. Use a Video Converter to convert the ripped VOB files to the video formats you prefer. 2. 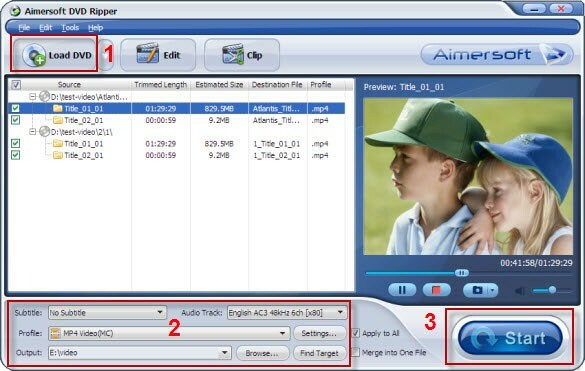 Turn to other software which can help you rip DVD to all popular videos, say Aimersoft DVD file converter, which can help you rip DVD to all popular video formats or rip DVD to optimized videos for playback on iPad, iPod, iPhone, PSP, Zune, Creative Zen, Xbox 360, Nokia, Apple TV, etc. The Mac version Aimersoft DVD ripper for Mac OS is also provided. Aimersoft DVD Ripper is easy to handle. Only with a few simple clicks, you can finish converting DVD to various format with ease on Windows-based computer. 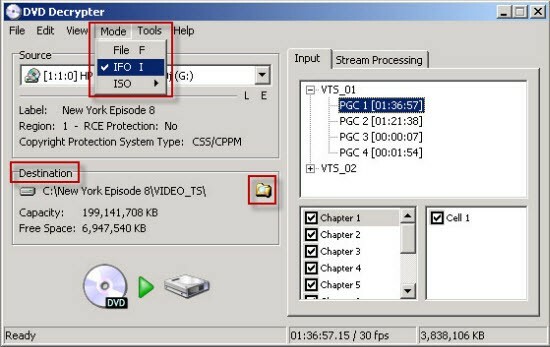 Here's how it works: Launch this DVD ripping tool and click the Load DVD button to add the DVD files you want to convert; open the output format menu by cliking the Profile option; when you have designate readily an output file format, click the Start button to begin ripping DVD immediately. The conversion will be finish in a few minutes. It's really that simple. Download to try it now! Direct Stream Copy - Demux - Raw What''s the difference? I am unable to chose a Source from the drop down menu. Why would this be? I have a portable player connected and I can play the movie. That's probably because your input files are not Decrypter supported VOB format. In your case, I suggest you try on Aimersoft DVD Ripper, which will helps you get rid of the problem mentioned above. When I use Decrypter to "burn" a movie on to a DVD to watch on my big screen I sometimes get jumps, skips and read errors. What causes this and how can I fix? Hello, you can have a try on Aimersoft DVD Ripper. It is able to rip and convert DVD to any formats with fast speed and high quality. NO, it won't ruin your DVD contents.